French Republic passport for Elias Shakkal issued May 10, 1920. It states that he was born in Aleppo [Alep], lived in Beirut, and was travelling to the U.S. He was not accompanied by anyone else. 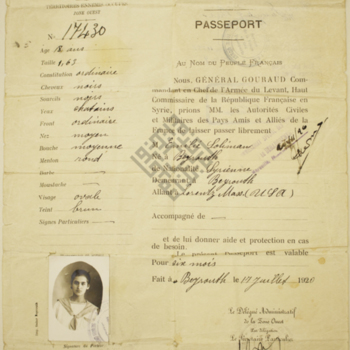 An immigration record issued in Naples, Italy, on March 27 1914, for a journey to New York. The record, likely a ticket, was issued to Saud [?] [Saa?]. An immigration record for an A[?] Selim indicating prepaid passage on the Austro-American line in 1912. On the back, handwritten in pencil, is "Arrived October 17, 1912 at New York."